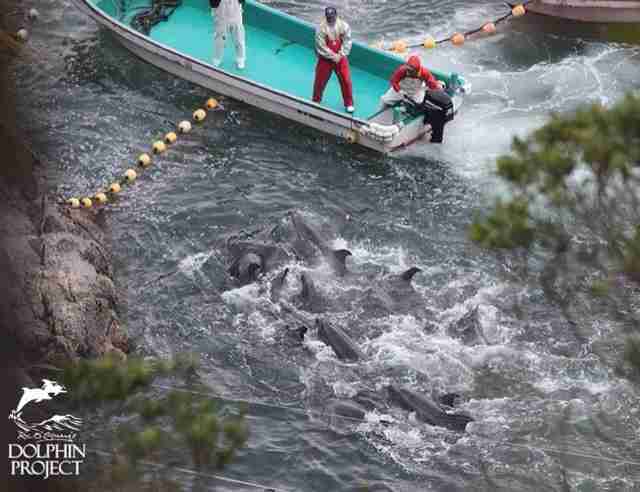 If they knew what happened to these dolphins, they wouldn't be doing this. 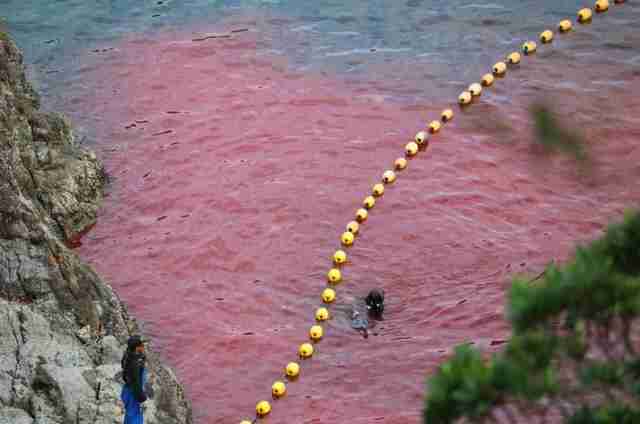 Recent footage shows throngs of tourists swimming with dolphins in the infamous Taiji killing cove - without realizing the waters are usually red with blood. Each year from September to March, Japanese hunters conduct drive hunts in the waters around Taiji, Japan, banging on metal pipes to disrupt the dolphins' sonar and driving them into the Taiji Cove. There, the disoriented animals are trapped in pens, and brutally slaughtered in front of their families, turning the waters a bright red. The choicest animals - usually the younger and attractive ones - are plucked out and sold to marine parks around the world for as much as $154,000 apiece. According to The Dolphin Project, during the warm summer months when the hunt is suspended, the nearby Taiji Whale Museum - which purchases many of the drive hunt dolphins - relocates its dolphins to Taiji Cove to create a tourist attraction. Visitors can interact with the dolphins while swimming in the cove, and are never informed about the the violent history of the space. Ric O'Barry, founder of The Dolphin Project and a former dolphin trainer who was featured in the 2009 film "The Cove," told The Dodo that most members of the Japanese public would be horrified if they knew where they were swimming. Warning: Mildly graphic photos below. "The Taiji Whale Museum is right next door to the the cove," he said. "So people think that the cove is an extension of the museum. They have no idea what goes on. They'd never step foot in that bloody water if they did." While many proponents of the hunts claim they're a Japanese "tradition," they have only been established in the past few decades due to the lucrative nature of the dolphin trade. The drive hunts weren't even possible until the availability of motor boats. Though a large portion of the Japanese public is opposed to the drive hunts or unaware of them, the hunts unfortunately have the backing of the city of Taiji, which also owns the Taiji Whale Museum. "It's a museum of killing," O'Barry said, noting the facility is filled with harpoons and similar displays. 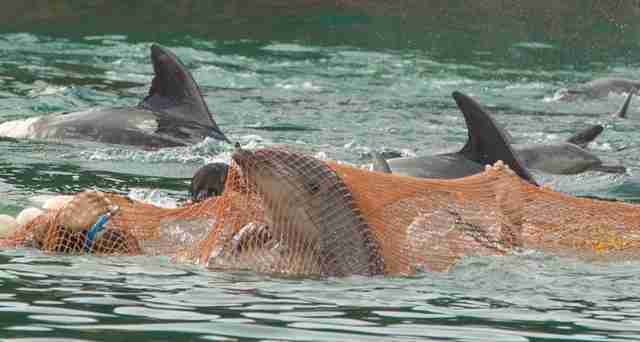 Each year, entire families of dolphins are killed in the cove, stabbed with spikes that sever their spinal cords. Others die from fear and panic. Many whales are also rounded up in the drives. For O'Barry, it's impossible to separate the hunts from the demand for captive dolphins that makes them so lucrative. Even the marine parks and aquariums who don't purchase from Taiji, he said, are misleading the public by pretending the stress of dolphin captivity aids in conservation. 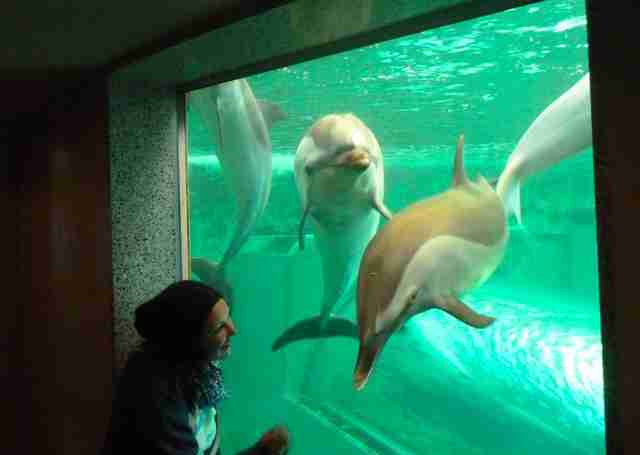 "Every dolphinarium in America, Europe, tricks people into thinking they're helping conservation," he said. "If you're a dolphinarium ... you're a professional liar. You have to lie to the public, you have to lie to the media, and you have to lie to yourself." Though many marine parks, such as SeaWorld (which does not take dolphins from Taiji), argue that keeping dolphins captive helps young visitors care about their counterparts in the wild, O'Barry, who worked as the head dolphin trainer for the TV show "Flipper" before quitting after one of his dolphins appeared to commit suicide, said that argument doesn't hold weight. "Those same kids will never see a snow leopard," he said. "Does that mean we have to go into the Himalayas and drag a snow leopard into the room? Or do we teach them to control their desires?" But with the upcoming season of the Taiji hunts set to kick off next month, dozens more animals will likely be sold off to international marine parks, while their families are butchered in the cove. O'Barry and his team plan to be on the scene, as they are every year, to document the killing and make sure that members of the Japanese public and the international community know what's happening. "It's all about money," he said of the industry. "It's about greed." 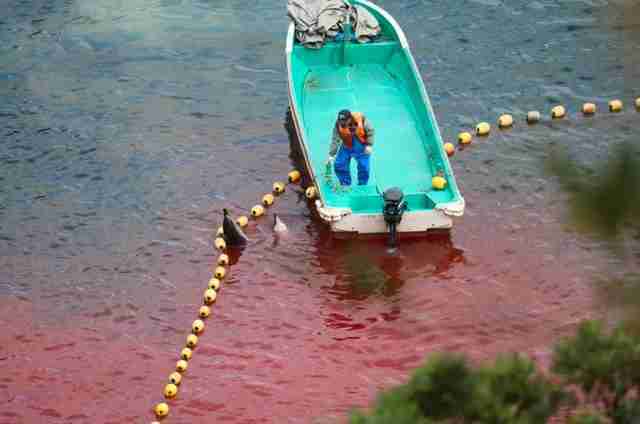 Want to help stop the Taiji dolphin slaughter? You can donate to The Dolphin Project to assist their efforts, and sign a pledge to avoid dolphin shows. If you're interested in joining the team traveling to Japan this year to document the slaughter, you can find more information here.